Seal 341 was formulated to enhance the rich, natural colors of your hard floors without leaving a shiny, plastic-looking surface. It also seals resilient tile floors to create a smooth, unbroken base for high speed finishes. The attractive, low lustre finish not only enhances the natural colors in hard floors, it protects all floors from dirt, spills, and abrasions that come from heavy traffic. 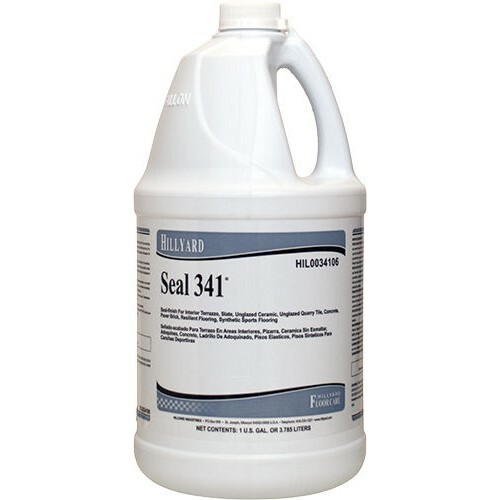 Seal 341 is easy to apply, and economical. It can be applied as a seal- finish to terrazzo, unglazed ceramic, quarry tile, concrete, paver brick, unpolished marble, slate, natural stone, resilient tile, and synthetic sports floors. Formulated to dry fast (less than one hour), so there is no long wait or extended downtime. Seal 341 applies quickly and easily with an average coverage of 1000 - 1500 square feet per gallon.